Will a digital Beatles 'reunite' at the Hollywood Bowl? We love stories like these, especially when they come from tabloids. Here's the latest wacky one: according to the Daily Star, The Beatles will be 'reuniting' at the Hollywood Bowl for a concert scheduled next 27 August. How is this possible, you ask? Good question. As the Star reports, the two surviving ex-Beatles, Sir Paul McCartney, 68, and Ringo Starr, 70, will perform with digital images of the late John Lennon and George Harrison, plus supplemental live musicians, for the next-best-thing to a full Beatles concert since 1966. 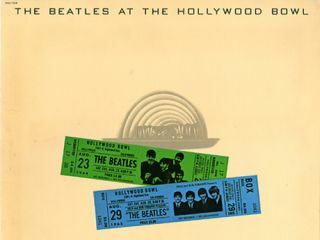 The Beatles performed at the famed Hollywood Bowl twice during their career, once in 1964 and again in 1965. Were the show to take place, this wouldn't be the first time that musicians have performed with a deceased bandmate: members of Elvis Presley's stage band, the TCB Band, led by guitarist James Burton, have been touring with an onscreen image of The King for several years. Check out the video below - which makes us really hope this story is one to be relegated to the rumor file, and quickly.